One of the dominant trends in enterprise software today is the empowerment of business users, and Tibco made two product announcements on Tuesday that play into that. First and foremost, Tibco Simplr is a new service that aims to bring automation capabilities to the nonexpert knowledge worker. First discussed by Tibco last year, Simplr aims to help such professionals automate tasks in just a few steps. Tibco has long built software for developers, but Simplr takes its efforts in a new direction, said Brad Topliff, senior cloud product manager. Knowledge workers and citizen developers are just "people who have stuff to do," Topliff said. "What Simplr is attempting is to bring integration to people who don't use the word 'integration' or even the word 'data.'" A user with an event to plan, for instance, might need to put together a form for attendees. "Say there are 400 salespeople coming, and you need to ask if they want steak, chicken or a vegetarian option for lunch," he said. 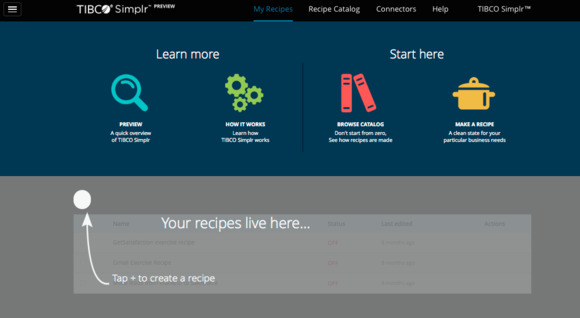 Using what Tibco calls "recipes" and with some basic configuration, Simplr can help put together a series of automated steps to get that form built and distributed. Along the way, it can use what Tibco calls "connectors" to make the necessary connections with other software and services, such as to pull data out of a survey application. Users can change their automation "recipes" by adding connectors or interactions. Now in invitation-only preview, Simplr is due to launch into beta next week. Tibco also announced version 4.0 of its ActiveMatrix BPM application, which aims to enable users to compose interactive business applications rapidly and -- again -- without IT's help. A key emphasis in ActiveMatrix BPM 4.0 is support for rapid experimentation. "We're looking at projects that take two to three weeks rather than 18 months," said Rachel Brennan, Tibco's director of product marketing for ActiveMatrix. "This is innovation through experimentation." ActiveMatrix BPM 4.0 is due to be available on Friday.